Since the Oso Landslide there have been encouraging things happening on the Whitehorse Trail, on the ground and in the news. 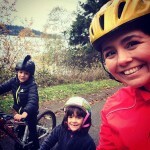 Snohomish County Bikes: an ongoing series highlighting great Snohomish County bike rides, issues, and events. 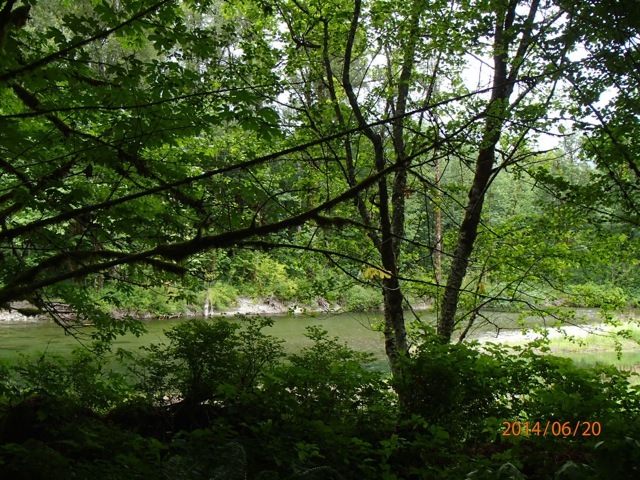 Note: This post was originally published by the Centennial Trail Coalition of Snohomish County and written by its board secretary and Darrington resident, George Winters. 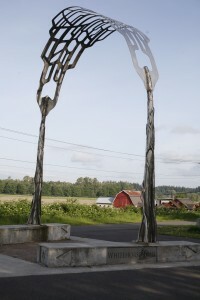 Completing the 27-mile Whitehorse Trail will connect Arlington and Darrington through the stunning Stillaguamish Valley and will tie into the Snohomish County Centennial Trail system. Activity to complete the Whitehorse Trail has gained traction in response to the SR 530 slide near Oso. 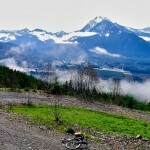 As the residents of the Stillaguamish Valley seek to recover from the tragedy, completing the Whitehorse Trail serves as one economic redevelopment strategy to attract bike travel and tourism to the area. 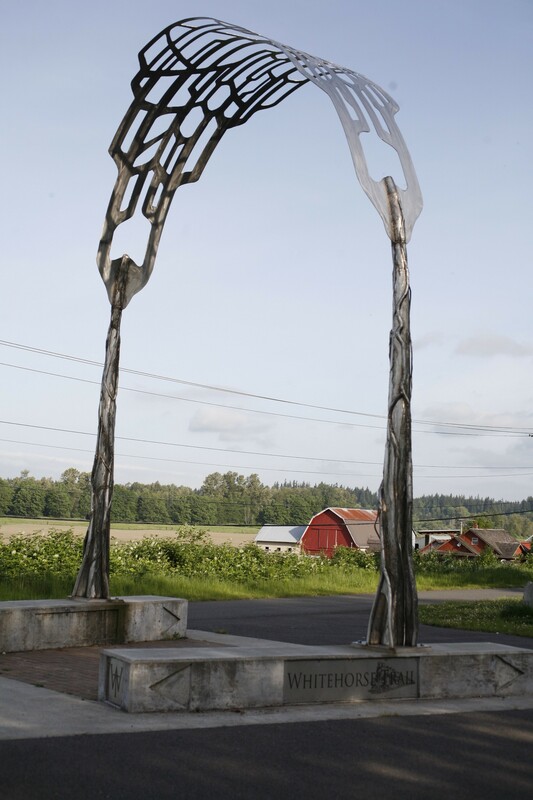 Snohomish County’s recent purchase of the Snohomish County section of the Eastside Rail Corridor means that with adequate funding, a dedicated trail network from cities like Seattle and Kirkland will ultimately extend over 70-80 miles north up to Darrington. 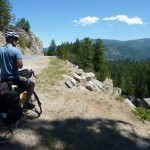 The Whitehorse Trail holds the promise to become a bike travel and tourism destination providing non-motorized access to some of the greatest Cascade Mountain vistas and wilderness in Washington state. There have been encouraging things happening on the Whitehorse Trail, on the ground and in the news. On June 20th, the last day of Spring, what one might call Summers Eve, I found an ambitious crew working away on the Whitehorse Trail near Fortson Mill Ponds. Snohomish County has hired several summer work crews as part of a community development plan. The trail near Forston Mill Pond is much wider than I realized, now that a crew has been out removing the old growth salmon berry and invasive weeds. Now you can find the trail. There is also new gravel on the access road. 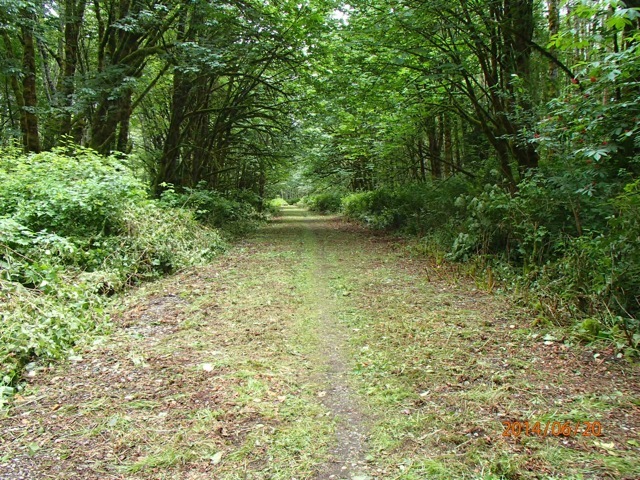 The photo above shows the huge improvement compared with what the trail looked like before, which was similar to the photo below. 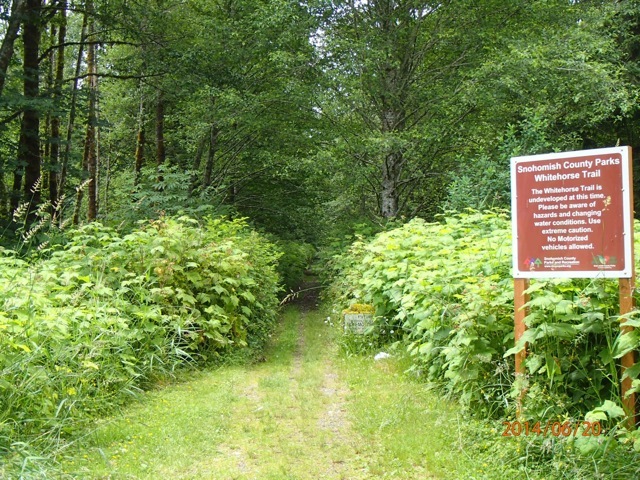 This is what an untended section of the Whitehorse Trail looks like just west of Swede Heaven Road. There was only a small contingent of the work crew present when I encountered them, but the enormous effort and accomplishment in the past week is quite evident. I have heard encouraging rumors of other improvements in the works: bridge decking and proper gates at the road crossings. I look forward to future trips watching the progress. With the new brush removal, the views of the river have improved. It is good to hear that the County is committed to this additional luxury along with all the needed restoration work. The Oso Slide has created many huge needs. Helping families recover, and re-establishing full road access to Darrington are the current priorities, but the future of the Whitehorse Trail is still a promising work in progress. 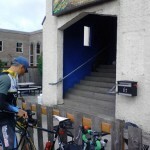 This article was posted in Advocacy, Arlington, Darrington, Economic Impact, Funding/Policy, Infrastructure, Issues & Advocacy, Legislature, News, Oso, Rural, Snohomish County, Tourism, Trails, Transportation. Bookmark the permalink. Follow comments with the RSS feed for this post. Both comments and trackbacks are closed.